We are glad to inform you that KPK Elementary Education Department Kohat has announced the result of educators appeared in the respective NTS Test. Kohat Educator Jobs NTS Result is gonna dispatched over here systematically. Such posts namely are (CT, DM, PIT, TT, AT, Qareeia and Primary School Teacher) which needs to be filled by the passing applicants accordingly. For such positions overall qualification which were required for these posts includes Bachelor’s degree and Masters from HEC recognized institute along with 9 months training in RITE/PITE Institute are required. Upon such positions the eligibility criteria was that Age limit stood at 18-35 years.Specific quota is reserved for Disabled applicants and Minorities. NTS is authorized to conduct the test against these positions and the marks obtained will be distributed according to the made rules. Applicants will be hired on contract/ad-hoc basis for the duration of one year which will be extended on account of applicants performance. 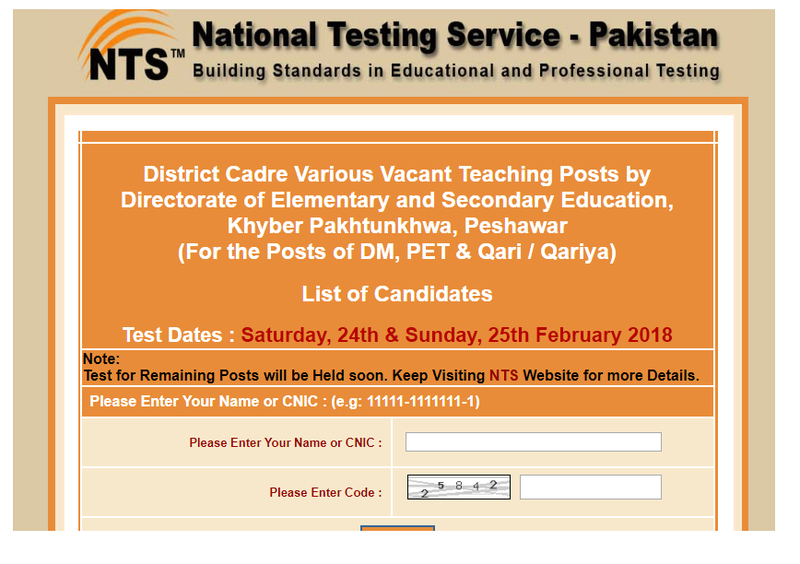 Test against the said posts held on 24th and 25th February respectively.Candidates waiting for the result are strongly advised to take print of their result card from here.As NTS official link is being given over here. Education Department in KPK taking effective measures to revamp the overall structure with respect to quality as well.These posts specifically prevailed under the speedy recruitment process under national testing service of Pakistan in a very transparent and systematic manner.Such revolutionary steps are being taken in order make enrich the education infrastructure on primary as well as Elementary and secondary level.The candidates who have cleared the NTS exam with remarkable score are strongly advised to prepare themselves for interview.Now properly applications along with NTS result card will be submitted in District Education Department Kohat within prescribed deadline. Remaining recruitment process shall entail maximum 20 to 30 days.After conducting interview the final merit lists shall also be uploaded over here.